London Days: Dare To Be Fabulous! I have been not so well over the last week and been staying in but it has helped me get some crafty projects in. My card today dares you to be Fabulous...I know you all are! These stamps are super old from PTI and I only came across them when I was looking for another stamp. Then 'ping' the idea arrived. The Mendhi was heat embossed in gold and then the sentiment heat embossed in white and popped up. I know this card looks super CAS but it took me ages to decide what card base to use and what colour enamel dots. I messed about for ages until I was happy with the look. Sending hugs that you're feeling better soon! So glad you experienced the 'ping' that brought you to the rich gold and regal purple! Stunning! Ohhh... I love that gold medallion against the purple! So royal looking! Ahhh...this so gorgeous. Love the gold and purple combo! Certainly you are fabulous! Sandie this is just gorgeous I love the purple with gold! Stunning! I love the gold on that purple. Hope you're feeling better. Beautiful! What a great medallion stamp! It was worth putting in some time to get the look you liked in the end, Sandie - your cards looks absolutely gorgeous!!!! 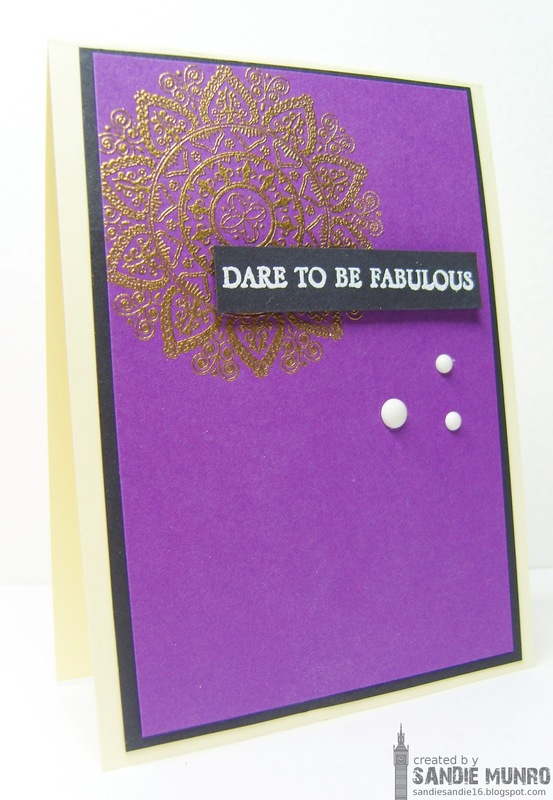 The gold and purple are soooooo beautiful and I love the little bit of white you added with the sentiment and the dots!!!! All of your 'messing about' paid off, Sandie ... LOve the Mehndi for the Sketch, and the purple gold combo is gorgeous! This is gorgeous, Sandie! Fabulous take on the sketch! Oh, I love this, fantastic colors and arrangement of elements. Ultra feminine! Pretty card! 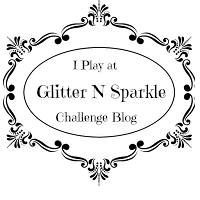 Thanks for sharing with us at Glitter 'N' Sparkle!